The Merseburg charms or Merseburg incantations (German: die Merseburger Zaubersprüche) are two medieval magic spells, charms or incantations, written in Old High German. They are the only known examples of Germanic pagan belief preserved in the language. They were discovered in 1841 by Georg Waitz, who found them in a theological manuscript from Fulda, written in the 9th century, although there remains some speculation about the date of the charms themselves. The manuscript (Cod. 136 f. 85a) is stored in the library of the cathedral chapter of Merseburg, hence the name. The Merseburg Charms were entered on the flyleaf (here right) of a sacramentary, which was later bound into a miscellany with other manuscripts. The Merseburg charms are the only known surviving relics of pre-Christian, pagan poetry in Old High German literature. The charms were recorded in the 10th century by a cleric, possibly in the abbey of Fulda, on a blank page of a liturgical book, which later passed to the library at Merseburg. The incantations have thus been transmitted in Caroline minuscule on the flyleaf of a Latin sacramentary. The spells were published later by the Brothers Grimm in On two newly-discovered poems from the German Heroic Period (1842). The manuscript of the Merseburg charms was on display until November 2004 as part of the exhibition "Between Cathedral and World - 1000 years of the Chapter of Merseburg," at Merseburg cathedral. They were previously exhibited in 1939. Each charm is divided into two parts: a preamble telling the story of a mythological event; and the actual spell in the form of a magic analogy (just as it was before... so shall it also be now...). In their verse form, the spells are of a transitional type; the lines show not only traditional alliteration but also the end-rhymes introduced in the Christian verse of the 9th century. 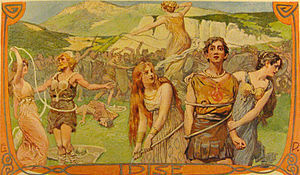 The first spell is a "Lösesegen" (blessing of release), describing how a number of "Idisen" freed from their shackles warriors caught during battle. The last two lines contain the magic words "Leap forth from the fetters, escape from the foes" that are intended to release the warriors. "Wodan Heals Balder's Horse" (1905) by Emil Doepler. Phol is with Wodan when Baldur's horse dislocates its foot while riding through the forest (holza). Wodan intones the incantation: "Bone to bone, blood to blood, limb to limb, as if they were mended". Figures that can be clearly identified within Continental Germanic mythology are "Uuôdan" (Wodan) and "Frîia" (Frija). Depictions found on Migration Period Germanic bracteates are often viewed as Wodan (Odin) healing a horse. Comparing Norse mythology, Wodan is well-attested as the cognate of Odin. Frija the cognate of Frigg, also identified with Freyja.Balder is Norse Baldr. Phol is probably a masculine form of Uolla, and, as Grimm suggested, the context makes it clear that it is another name for Balder.Uolla has been linked to Fulla, a minor goddess and a handmaid of Frigg. Sunna (the sun) in Norse mythology is Sól, though her sister Sinthgunt is otherwise unattested. Many analogous magic incantations to the Second Merseburg Charm (horse-healing spell), have been noted. Some paralleling is discernible in other Old German spells, but analogues are particularly abundant in folkloric spells from Scandinavian countries (often preserved in so-called "black books".). Similar charms have been noted in Gaelic, Lettish and Finnish suggesting that the formula is of ancient Indo-European origin. Some commentators trace the connection back to writings in ancient India. As Grimm explains, the spell tells the nesso worm and its nine young ones to begone, away from the marrow to bone, bone to flesh, flesh to hide (skin), and into the strâla or arrow, which is the implement into which the pest or pathogen is to be coaxed. It closes with the invocation: "Lord (Drohtin), let it be". Grimm insists that this charm, like the De hoc quod Spurihalz dicunt charm (MHG: spurhalz; German: lahm "lame") that immediately precedes it in the manuscript, is "about lame horses again." And the "transitions from marrow to bone (or sinews), to flesh and hide, resemble phrases in the sprain-spells," i.e. the Merseburg horse-charm types. Jacob Grimm in his Deutsche Mythologie, chapter 38, listed examples of what he saw as survivals of the Merseburg charm in popular traditions of his time: from Norway a prayer to Jesus for a horse's leg injury, and two spells from Sweden, one invoking Odin (for a horse suffering from a fit or equine distemper[b]) and another invoking Frygg for a sheep's ailment. He also quoted one Dutch charm for fixing a horse's foot, and a Scottish one for the treatment of human sprains that was still practiced in his time in the 19th century (See #Scotland below). der reed han syndt sit Folebeen. At det skulde blive i samme stad. There he rode the leg of his colt in two. That it might remain in the same place. And as he rode, his horse's bone was broken. Bone to bone, flesh to flesh. The number of Norwegian analogues is quite large, though many are just variations on the theme. Bishop Anton Christian Bang compiled a volume culled from Norwegian black books of charms and other sources, and classified the horse-mending spells under the opening chapter "Odin og Folebenet", strongly suggesting a relationship with the second Merseburg incantation. Bang here gives a group of 34 spells, mostly recorded in the 18th–19th century though two are assigned to the 17th (c. 1668 and 1670), and 31 of the charms are for treating horses with an injured leg. The name for the horse's trauma, which occurs in the titles, is Norwegian: vred in most of the rhymes, with smatterings of raina and bridge (sic. ), but they all are essentially synonymous with brigde, glossed as the "dislocation of the limb" [d] in Aasen's dictionary. No. 6, Jesus red sig tile Hede.." (c. 1714. Veø, Romsdal). Same as Grimm's LII quoted above. Vår herre Jesus Kristus och S. Peder de gingo eller rede öfver Brattebro. S. Peders häst fick vre eller skre. Vår herre steg af sin häst med, signa S. Peders häst vre eller skre: blod vid blod, led vid led. Så fick S. Peders häst bot i 3 name o.s.v. Our Lord Jesus Christ and St. Peter went or rode over Brattebro. St. Peter's horse got (a dislocation or sprain). Our Lord dismounted from His horse, blessed St. Peter's horse (with the dislocation or sprain): blood to blood, (joint to joint). So received St. Peter's horse healing in three names etc. etc. "Vår herre red ad hallen ned. Hans foles fod vrednede ved, han stig aff, lagde leed ved leed, blod ved blod, kiöd ved kiöd, ben ved ben, som vor herre signet folen sin, leedt ind igjen, i naffn, o.s.v." Rydberg, after Arcadius, (1883) ? "Our Lord rode down to the hall. His foal's foot became sprained, he dismounted, laid joint with joint, blood with blood, sinew with sinew, bone with bone, as our Lord blessed his foal, led in again, in the name of, etc." A spell beginning "S(anc)te Pär och wår Herre de wandrade på en wäg (from Sunnerbo hundred, Småland 1746) was given originally by Johan Nordlander. as it was best, when it was whole." der vred han sin Fod af Led. Saa satte han sig ned at signe. sprained his foot in the joint. and bonded were his joints together! Alexander Macbain (who also supplies a presumably reconstructed Gaelic "Chaidh Criosd a mach/Air maduinn mhoich" to the first couplet of "The Lord rade" charm above) also records a version of a horse spell which was chanted while "at the same time tying a worsted thread on the injured limb." Air am bristeadh mu seach. He put bone to bone. Macbain goes on to quote another Gaelic horse spell, one beginning "Chaidh Brìde mach.." from Cuairtear nan Gleann (July, 1842) that invokes St. Bride as a "he" rather than "she", plus additional examples suffering from corrupted text. may Dhātar[k] excellently put that together again, joint with joint. together let what of your flesh has fallen apart, together let thy bone grow over. let thy blood, bone grow; let flesh grow with flesh. let thy blood, bone grow; put together what is severed, O herb..., etc. However, the Rohani (Rōhaṇī Sanskrit: रोहणी) here apparently does not signify a deity, but rather a healing herb; in fact, just an alternate name for the herb arundathi mentioned in the same strain. ^ In the original text of Grógaldr, the text that Bugge emended to leysigaldr actually reads leifnis eldr". This is discussed by Rydberg as "Leifner's or Leifin's fire", and connected by him to Dietrich von Bern's fire-breath that can release the heroes from their chains. ^ Fortunately Thorpe (1851), pp. 23–4, vol.1 provides an English translation side by side with the Swedish charm, and clarifies that the condition, in Swedish floget or the 'flog' is "horse distemper". Grimm says it corresponds to German: anflug or a "fit" in English, but it is hard to find any sources precisely defining this. ^ Griffiths only vaguely identifies this as a "Norwegian charm, written down in the 19th century", citing Stanley (1975), p. 84 and Stone (1993). The century dating conflicts with Grimm and Bang's attribution. ^ brigde Danish: Forvridning af Lemmer (dislocation of the limbs). ^ No. 7 and a text similar to No. 21 are used as parallels in the Norwegian Wikipedia article, no:Merseburgerformelen. ^ Although a couple of charms (No. 40, No. 127) among some 1550 in Bang's volume do name the pagan god. ^ Giangrosso 2016, p. 113. ^ Steinhoff 1986, p. 410. ^ Bostock 1976, p. 26. ^ Steinhoff 1986, p. 412. ^ Giangrosso 2016, p. 112. ^ a b c Lindow, John. Norse Mythology: A Guide to the Gods, Heroes, Rituals, and Beliefs (2001) Oxford: Oxford University Press. ISBN 0-19-515382-0. ^ Jeep's translation gives "Freya". Benjamin Thorpe (Northern Mythology, 1851, p. 23) actually read the manuscript as having Frua rather than Friia, Frua being the cognate of Norse Freyja. ^ Steinhoff 1986, p. 413. ^ Bostock 1976, p. 32. ^ translation from Benjamin W. Fortson, Indo-European language and culture: an introduction, Wiley-Blackwell, 2004,ISBN 978-1-4051-0316-9, p. 325. ^ Bugge, Sophus (1867). Sæmundar Edda hins Fróda: Norroen Fornkvaedi. P. T. Mallings. p. 340. ^ Murdoch, Brian (1988). "But Did They Work? Interpreting the Old High German Merseburg Charms in their Medieval Context". Neuphilologische Mitteilungen. 89: 358–369. , p.365, footnote. Quote: "The existence of the term "leysigaldr" in Old Norse is seductive, but does not constitute proof of the existence of these outside the realm of fiction, or that it can be applied to the Merseburg charm. " ^ Rydberg, Viktor (1907). Teutonic mythology. 1. Rasmus Björn Anderson (translator. S. Sonnenschein & Co. p. 61. ). ^ a b c Murdoch, Brian (2004). German Literature of the Early Middle Ages. Camden House. p. 61. ISBN 9781571132406. ^ Fath, Jacob (1884). Wegweiser zur deutschen Litteraturgeschichte. pp. 7–8. ^ Bang's Norse hexeformulaer collection lacks commentary, but Bang (1884) makes clear he subscribes to the parallelism view espoused by Grimm and Bugge. ^ Aasen, Ivar Andreas (1850). Ordbog over det norske folkesprog. Trykt hos C. C. Werner. ^ Bang, Anton Christia (1884). Gjengangere fra hedenskabet og katholicismen blandt vort folk efter reformationen. Oslo: Mallingske. pp. 167-. ^ Rydberg, Viktor (1889). Undersökningar i Germanisk Mythologi. 2. A. Bonnier. p. 238. ^ Kock, Axel (1887). "Var Balder äfven en tysk gud ?". Svenska landsmål och svenskt folkliv. 6: cl (xlvii-cl). ^ Nordlander, J. (1883). "Trollformler ock signerier (Smärre Meddelanden Nr. 2)". Svenska landsmål och svenskt folkliv. 2: xlvii. ^ Kuhn, Adalbert (1864). "Indische und germanische segensprüche". Zeitschrift für vergleichende Sprachforschung auf dem Gebiete der indogermanischen Sprachen. 13: 49–73 . ^ Thiele, Just Mathias (1860). Den Danske almues overtroiske meninger. Danmarks folkesagn. 3. Kjöbenhavn: C.A. Reitzel. pp. 124–125. ^ Cebrián, Reyes Bertolín (2006). Singing the Dead: A Model for Epic Evolution. Peter Lang. pp. 17–18. , quote: "..The parallels of the Merserburger Charm in Vedic literature..," is followed by the text of the Atharvaveda 4,12 and translation by Whitney (1905). ^ Wilhelm, Friedrich (1961). "The German Response to Indian Culture". Journal of the American Oriental Society. 81 (4–2): 395. doi:10.2307/595685. JSTOR 595685. , "one of the " Merseburger Zauberspruche " (Merseburg Spells) which has its parallel in the Atharvaveda"
^ Eichner, Heiner (2000–2001). "Kurze indo-germanische Betrachtungen über die atharvavedische Parallele zum Zweiten Merseburger Zauberspruch (mit Neubehandlung von AVS. IV 12)". Die Sprache. 42 (1–2): 214. ^ Tilak, Shrinivas (1989). Religion and Aging in the Indian Tradition. SUNY Press. Braune, Wilhelm; Helm, Karl; Ebbinghaus, Ernst A., eds. (1994). Althochdeutsches Lesebuch: Zusammengestellt und mit Wörterbuch versehen (17th ed.). Tübingen. pp. 89, 173–4. ISBN 3-484-10707-3. Braune, Wilhelm, ed. (1921). Althochdeutsches Lesebuch: Zusammengestellt und mit Wörterbuch versehen (8th ed.). Halle: Niemeyer. p. 85. Bostock, J. Knight (1976). King, K. C.; McLintock, D. R. (eds.). A Handbook on Old High German Literature (2nd ed.). Oxford. pp. 26–42. ISBN 0-19-815392-9. Giangrosso, Patricia (2016). "Charms". In Jeep, John M. (ed.). Medieval Germany: An Encyclopedia. Abingdon, New York: Routledge. pp. 111–114. ISBN 9781138062658. Grimm, Jacob (1844). "Über zwei entdeckte Gedichte aus der Zeit des deutschen Heidenthums". Philologische und historische Abhandlungen der Königlichen Akademie der Wissenschaften zu Berlin. Aus dem Jahre 1842: 21–2. reprinted in: Grimm, Jacob (1865). 'Kleinere Schriften. 2. Berlin: Harrwitz und Gossman. pp. 1–29. Masser, Achim (1972). "Zum Zweiten Merseburger zauberspruch". Beiträge zur. Hamnia. 18. doi:10.1515/bgsl.1972.1972.94.19. ISSN 1865-9373. Steinhoff H (1986). "'Merseburger Zaubersprüche'". In Ruh K, Keil G, Schröder W (eds.). Die deutsche Literatur des Mittelalters. Verfasserlexikon. 6. Berlin, New York: Walter De Gruyter. pp. 410–418. ISBN 978-3-11-022248-7. Stone, Alby (1993). "The second Merseburg Charm". Talking Stick (11). Wadstein, Elis (1939). "Zum zweiten merseburger zauberspruch". Studia Neophilologica. 12 (2): 205–209. doi:10.1080/00393273908586847. Bang, Anton Christia, ed. (1901–1902). Norske hexeformularer og magiske opskrifter. Videnskabsselskabets skrifter: Historisk-filosofiske klasse, No.1. Kristiania (Oslo, Norway): I Commission hos Jacob Dybwad. ——— (1889b). Studien uber die Entstehung der nordischen Gotter und Heldensagen. Oscar Brenner (Germ. translator). Berlin: C. Kaiser. p. 306. Christiansen, Reidar Thoralf (1914). "Die finnischen und nordischen Varianten des zweiten Merseburgerspruches. Eine vergleichende Studie". FF. Communications. Hamnia: Suomalaisen Tiedeakatemian kustantama (18). Ebermann, Oskar (1903). "Blut- und Wundsegen in ihrer Entwicklung dargestellt". Palaestra:Untersuchungen und Texte aus der deutscehen und englischen Philologie. XXIV. Berlin: Mayer & Müller. Griffiths, Bill (2003). Aspects of Anglo-Saxon Magic (3rd revised edition) (snippet). Anglo-Saxon Book. ISBN 978-1-898281-33-7. ———. "List Poems in Old English". Pores 3. Retrieved 16 March 2018. ——— (1888). Teutonic mythology. 4. Stallybrass, James Steven (translator). W. Swan Sonnenschein & Allen. Hoptman, Ari (1999). "The Second Merseburg Charm: A Bibliographic Survey." Interdisciplinary Journal for Germanic Linguistics and Semiotic Analysis 4: 83-154. Kvideland, Reimund; Sehmsdorf, Henning K., eds. (2010). Scandinavian Folk Belief and Legend (snippet). University of Minnesota Press. ISBN 9780816619672. Lincoln, Bruce (1986). Myth, cosmos, and society: Indo-European themes of creation and destruction (snippet). Harvard University Press. p. 110. ISBN 9780674597754. Macbain, Alexander (1892a). "Incantations and Magic Rhymes". The Highland Monthly. Inverness: Northern Chronicle Office. 3: 117–125. ——— (1892b). "Gaelic Incantation". Transactions of the Gaelic Society of Inverness. 17: 224. Stanley, Eric Gerald (1975). The Search for Anglo-Saxon Paganism. (Reprint) Stanley, Eric Gerald (2000). Imagining the Anglo-Saxon Past. Boydell & Brewer. ISBN 978-0859915885. Thorpe, Benjamin (1851). Northern Mythology: Comprising the Principal Popular Traditions and Superstiotions of Scandinavia, North Germany, and the Netherlands. 1. London: Edward Lumley.